I had spent years preaching the PETE Gospel to uninterested peers most of my life, and now to finally find myself at the reunion to toast that unmistakably original piece of television history was the very least I could do. Said originality in programming, let alone “children’s programming,” has unsuccessfully been sorely copied ever since. 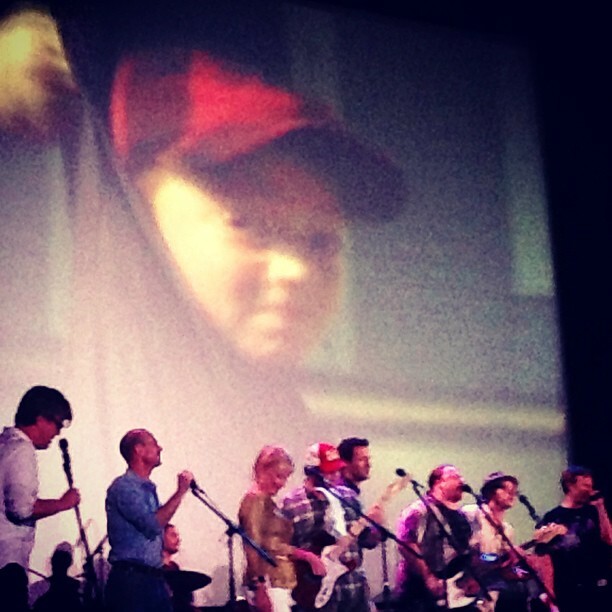 Personally, the show and the reunion ushered a plethora of bittersweet emotions that managed to frenzy in sheer celebration of grown children and cast alike, rejoicing in reuniting that sacred kinship shared so many years ago. What once was an under-sung piece of inspired television reminded me of my undeniably american reliance of the limitless possibilities that the show introduced me to when formulating a story. This is no revelation to admirers of the show, millions of other american rugrats (relevant pun) took to PETE and PETE for everything from a beginners guide to important artists (guest stars) , a guidance through the brutal honesty we couldn’t help but share as children, and the reckless abandon that can only cause revolutionary inspiration that seems to subside with age. Timeless. Celebrating the impact of that show on stage along side Mike, Danny, Toby, Will, Chris, and Judy might have ushered in the summer but reminded of me of the continuous Autumn of the show’s perturbed suburb, Wellsville. A parallel between the two places were mentioned by the cast and creators. Funny, now as a 27 year old man, Its obvious to me how Portland truly resembles that influence in spades. I understand this beautiful return is pretty generationally specific at first glance, too bad, because the show managed to introduce my generation to a massive roster of figureheads: (Kate Pierson, Michael Stipe, Steve Buscemi, Iggy Pop, etc.) If the gorgeous film, THE ASSASINATION OF JESSE JAMES… beautifully intertwined my interests as an artist in multiple mediums today, I have PETE AND PETE to thank for the introduction of multiple influences they beautifully tied together in my youth. Those that spent their youth reveling the uncanny barrage of brilliantly nuanced Nickelodeon Programming of the 90s seem to look no further than PETE’s trust, loyalty, and the autumnal summer of youth perfectly projected. I told Will and Chris that I vehemently appreciated their acceptance of young minds through treating the young audience as adults. The reunion acted as closure to a wayward year previously spent in an embarrassingly ridiculous drug habit in the limbo of Phoenix, Arizona. After I got clean, I manifested moving back to Portland. And my life has been focused ever since. And the reunion acted as a rebirth into honoring that childhood whimsy and fervor to do something lasting in this world. It was important that they knew that the show not only gave me solace for inhabiting an outsider personality as a child, but a reminder of the importance and duty we as artists all must abide in order to show the appreciation of life in all its messy fuss. THE ADVENTURES of PETE and PETE solidified a brevity I would often look for when dealing with the dirty and lovelorn webs we all weave. I am honored to be amongst the lucky few to give creedence and shake the hands that deserve recognition. What better way to get this adult thing on the road than to consider childhood heroes as peers who stumble so beautifully as I do. I left Mike “Big Pete” Marronna in between rustling the caravan of attendees and devotees aiming for a new bar. For some reason, I had drank enough and wanted nothing more to leave on a high note. My favorite part is the personal heart to heart Mike and I had before we jumped into our respective vehicles. Some is just for me, but I’ll never forget eachother’s refusal to say a definite goodbye to each other that night. He thought I was going to meet them at the next bar, instead, I decided to Seinfield it and leave without letting the cast and creators in on my need to call it a night. The young me would have never left them alone, instead, we drove home and listened to Polaris as I felt my childhood finally put to rest. The awesome thing is they’re the stars again on their ADVENTURES OF DANNY AND MIKE Podcast now. Above is a link to the first episode which has THE PETE’s take on this whole Portland thing. My DJ name will forever by DJ MAGICKEATS as evidenced in the podcast above! The word “blame” imploded in an audible supersoaker-like misfire: gooped-pellets spray in shotgun shell-like clusters, exploding in smaller amoebas each surface breached. I smiled at the ridiculousness of how beautifully weird the invasion on my writing occurred. Another gooble-globule tumbleweeded into the chaos, dispatched, to my horror, from something afoot in my mouth. Apparent only now by the new found liquid wash submerging my tongue. Pain brought my hand to my cheek. Lord, solidified cheeks will never be this much of a relief… no new facial cavities. That left the inside, the last thing I want. My mouth, always reminiscent of an open wound, forever unmended, with delicate bone sequestered as reminders of your fallibility…Why does this bloodgurt exist? My teeth, thankfully, didn’t chew a Harvey DENT through my cheek. Ahh yes, I’m actually still doin the thing that blood let my face in the first place. I realized I had been chewing my face, like a young, female cutter that hacked and hacked but alas, ironically plagued to never feel pain. Just then, while my right hand spazzemed secret diatribes in linear estimations, i had a g glimpse through perfectly clear vantage poised by an invisible peer, with a wide and detailed view o myself. As if I hiccuped an astral projection and caught a quick view of myself as I re-entered my body. But there was one terrible addition, the image of me as I sit there facing my astral body, was caked in dehydrated skin, peeling around the jack nicholson hairline and one vibrantly pale eye shifted slightly as if it saw my unseen maneuver. The one pale eye let go of my startled attention only to transfix on the milky dark whole that housed the other eye. Its my eye, the left one, that has my birthmark in it: a discernable, by contrast and size, the brown spotted azure eye’d absence gave me a pepto-worthy upset, the kind omens tend to proceed. I could’ve just had such impressive clarity in my mind’s eye about how I was sitting that the Inge impressed enough to spook. But why would I be so detailed, and gangrenous. I’ll stop writing the tower of gibberish saga later. I’m hungry. blood tastes like micromachines. I’m ready to continue, now. Its been a long while since updating this site. And the funny thing is, I have a spoiled time focusing my third-eye around needing to update the world on my artistic activities as to give myself some semblance as to my productivity. The last 8 or so months have been filled with experimentation in an array of different projects… some evolved into on-going endeavors, some took the necessary first steps of trial and error, and others were complete failures (a word I will allow as humorous low-blow in my quest for artistic reconnaissance). so updates will be made weekly. damn computers.